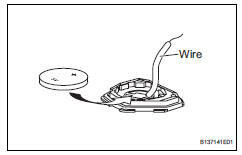 Twist the screwdriver in the direction of the arrow mark in the illustration, and open the transmitter housing cover. Inspect operation of the transmitter. emove the battery (lithium battery: cr2016) from the transmitter. Install a new or non-depleted battery (lithium battery: cr2016). From outside the vehicle, approximately 1 m (3.28 Ft.) From the driver side outside door handle, test the transmitter by pointing its key plate at the vehicle and pressing a transmitter switch. 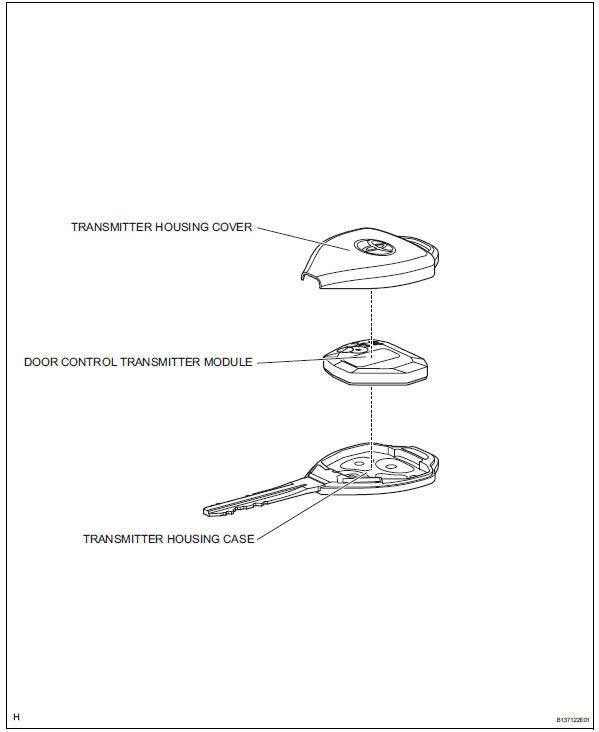 Ok: door lock can be operated via the transmitter. Led illuminates more than Once. The operating range differs depending on the user, the way the transmitter is held and the location. The transmitter's faint electric waves may be affected if the area has strong electric waves or noise. The transmitter's operating range may be shortened or the transmitter may not function. When checking the amount of energy left in the battery, the battery must be checked while it is installed in the transmitter (a resistance of 1.2 Kù is applied to the battery). When the battery energy is checked by itself (uninstalled), the voltage reading will be more than 2.5 V until the energy is depleted. If the transmitter is malfunctioning, the voltage reading of the energy left in the battery will be inaccurate. Remove the battery from the transmitter. Connect a wire to the negative (-) terminal of the transmitter and install the battery. Connect the tester's positive (+) lead to the battery and the negative (-) lead to the wire. When the temperature of the battery is low, the inspection result will not be accurate. When the inspection result is less than 2.2 V, conduct the test again after leaving the battery in a place with a temperature of 18? (64?) for more than 30 minutes. Read the voltage immediately after the switch is pressed. When 0.8 Seconds have passed after the switch is pressed, the automatic power off function starts and resistance applied to the battery will cease. The voltage of the battery will be 2.5 V or more. Press the switch at least 3 times before reading the voltage. If the battery temperature has just returned to 18? (64? ), the voltage may be unusually high for the first or second voltage reading. Install the transmitter housing cover to the transmitter housing case. Check that the transmitter's led illuminates 3 times when the switch is pressed 3 times. Ok: transmitter's led illuminates 3 times when switch is pressed 3 times.